The first time I read this book, I had a hard time getting into it. 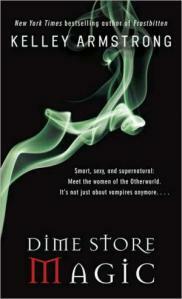 I loved Elena as the narrator of the first two books in the Otherworld series, and now, Paige is the narrator. I didn’t really like Paige in Stolen, but I have to admit I gained an appreciation for her throughout the course of this book. The story picks up about nine months after Stolen left off. Young Savannah is living with Paige and they’re developing a relationship, despite wariness from the Coven. But now half-demon Leah is back, helping Savannah’s biological father pursue custody. Savannah’s dad is Kristof Nash, a member of the sorcerer family that leads the Nast Cabal. This book really lays out the rich history of animosity between witches and sorcerers. And it lays the groundwork for the serious world-building surrounding the cabals and their families. One of the ways Armstrong does this, is with the introduction of Lucas. He’s the rebellious son of the Cortez cabal, who wants to right the wrongs of his sorcerer brethren. Here, he volunteers as a lawyer for Paige and Savannah. Of course, the custody battle gets ugly, as Leah works diligently to cast Paige in an unfavorable light. She’s painted as a black witch, and people around her either end up dead or rising from the grave. We get to see an unlikely relationship form between Paige and Lucas that took me a little by surprise… but I liked it. What I liked a little less, was Savannah. Yes, I know she’s been through a lot. But she is impetuous, thoughtless, and sometimes bordering on sociopathic. I keep trying to find sympathy for her. And her character does improve in later books. In this one however, I thought she was pretty awful. All in all, though, I did enjoy this book –and even more so on the second read. We see plenty more of Paige, Lucas, and Savannah in future installments. I like that all the characters of this series move in and out of each other’s orbits in such a way that there is still cohesion, even when we change narrators. And this is even more true, the more the series progresses. 4 stars. I haven’t read this yet because I also liked Elena so much that I was afraid I wouldn’t like a new narrator…I will pick this one up, once I get to it…my TBR list is a bit unreal….